The Art Fund Pavilion design competition called for a semi-permanent summer pavilion to be placed in the courtyard outside of The Lightbox in London. To be constructed utilizing digitally fabricated plywood and with a maximum square footage of 35 square meters, the pavilion was designed to house a multifunctional space. The space was designed to be easily converted from an exhibition space, a formal presentation space for up to thirty persons and an informal gathering space. 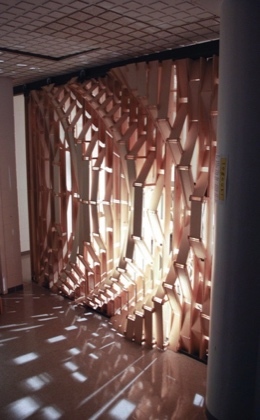 The plywood construction was designed based on a previous wall study executed as a research project. The design was thematically based using an analogy of a tree, the construction cartridges were conceived of as trunks, a series of sticks served as the structure for articulating the geometry of the skin and the leaves became the skin itself. Designed to be assembled in 72 hours and taken apart in 24 hours the pavilion attempts to strike a balance between concept and construction utilizing the parametric software Grasshopper. By articulating the buildings geometry, construction system and complexity through the parametric system a number of iterations were possible before selecting the proposed design.